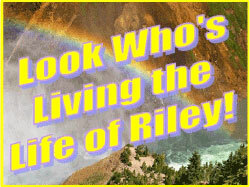 *** WINNERS *** Sylvia, Mike D., Calaeb and Janet are Living the Life of Riley! CONGRATS! I want to give a big and hearty CONGRATULATIONS to Sylvia, the winner of the Fill in the Blankie Ultra-Personalized Baby Blanket of Choice! Sylvia now has 48 hours to confirm! I also want to give a big and hearty CONGRATULATIONS to Mike D., the winner of the Pepto-Bismol Huge Holiday Prize Pack! Mike D. now has 48 hours to confirm! I also want to give a big and hearty CONGRATULATIONS to Calaeb, the winner of the Eight O'Clock Coffee Gift Set! Calaeb now has 48 hours to confirm! I also want to give a big and hearty CONGRATULATIONS to Janet, the winner of the Blue Turtle Kids $50 Gift Certificate! Janet now has 48 hours to confirm! *** WINNERS *** Margaret, Schmidty, Katrina and Ericka are Living the Life of Riley! CONGRATS!